The Amtrak loco’s have very nice cabs. 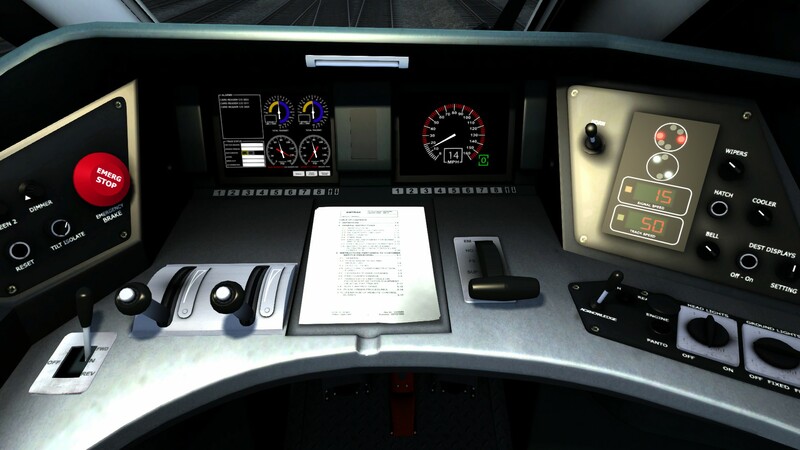 My Train Simulator review went live earlier this week, but with the joys of hindsight, I realise that I never actually played any of the new routes that come with the 2015 edition. The mix between the game automatically receiving a tech update from 2014 to 2015 along with my Steam media account all led to me being entirely confused about whether I was driving on any new routes last week. It turns out I wasn’t, although I had thoroughly enjoyed my time with the revised training mode, the TS Academy. This week then, I’ve spent some time with the new routes by putting my new found knowledge of how to drive the trains into practice. My first port of call was to America on the New York to New Haven line with some of the new Amtrak loco’s that are making their first appearance in the game. My first route was a short twenty minute hop from one station to another in the smaller loco that I took a snazzy picture of at the top of the post. Things started well, I got the passengers boarded, requested permission to move through the red signal and was on my way. I managed some speed alterations without any issue, taking in the New York State scenery as I went. Things were going pleasantly, I passed a few other trains and I was content. Then I had an alarm signal to inform me of a speed change ahead which I thought I turned off properly. Obviously not, as after going through the signal, the automatic systems on the train thought I hadn’t acknowledged the warning, and in turn the emergency brake was applied. Points, and time, were lost and I found myself in a race to make it to my destination in time. Through some judicious control of the throttle, I kept close to the speed limit without breaking it, which would have lost me points. Soon enough, I pulled up to the station and came to a stop. I tried to open the doors for the passengers, but the option didn’t appear when I was looking down the platform. It turned out that I hadn’t quite pulled the train forward enough, once I edged forward a little bit…I was a couple of minutes behind schedule. Points lost, along with any chance of a medal for the mission. My next trip was with one of the more powerful Amtrak machine, still in New York State. This started the scenario with the train already moving, at a slow pace towards a station. I thought this would automatically get me to the station on time, and began checking Twitter on my tablet. By the time I came to a perfect stop at the station, without having to do anything…I was a few minutes past my arrival time. A massive number of points were lost, so I decided to have some fun. I put the speed control all the way to the max rocketing the train to well over 120mph and breaking all kinds of speed limits. I hit the big red button for the emergency brake…and still took a good mile and a half to stop. I think it is clear why I’m not in the train business. 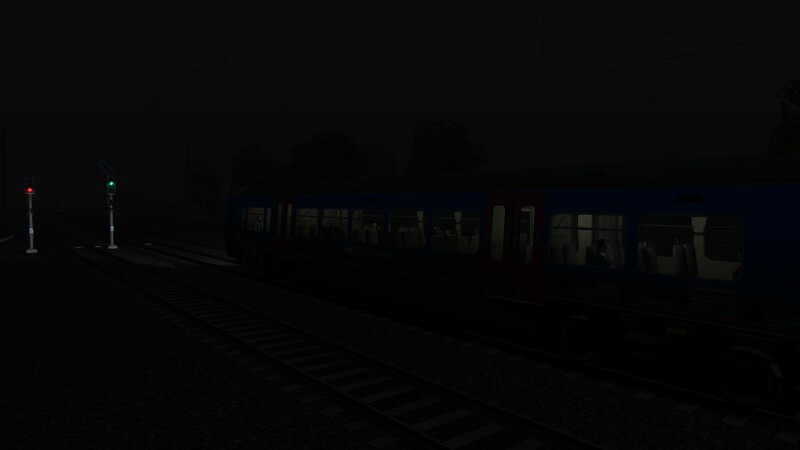 An evening route on a small inter-city route in Britain. I took another journey earlier this morning, this time on the East Coast Main Line with a service from Kings Cross to Peterborough. The scenario took me from the sleepy town of Biggleswade up to Peterborough in an old, rickety Class 365 First Capital Connect in the evening. It was an interesting journey as I had to get used to a different acceleration and braking system to the Amtrak’s and the trains I trained on in the TS Academy. I was of course using the control overlay to help me with things, but I still managed to entirely mess up the approach to my first stop. I putt the brakes on extremely early, and nearly coasted to a stop half a mile from the station before putting more power on.